EPA Administrator Scott Pruitt, accompanied by EPA Chief Financial Officer Holly Greaves, testifies before a House Energy and Commerce subcommittee on Capitol Hill on Thursday. It's the first time Pruitt appeared before lawmakers since weeks of accusations prompted a string of investigations — by the EPA Inspector General's office, at the Government Accountability Office and in Congress. Pruitt has drawn scrutiny for a sweetheart housing arrangement in a condo owned by the wife of a lobbyist, hefty pay raises granted to staffers over the objection of the White House, a $43,000 soundproof phone booth he installed in his office and the reassignment of staffers within the agency who criticized the administrator's moves. "You have failed as a steward of American taxpayer dollars and our environment," said Rep. Paul Tonko, D-N.Y., at the hearing of the House Energy and Commerce Environment Subcommittee. "Every indication we have is that you really should resign," added Rep. Frank Pallone, D-N.J., the top Democrat on the House Energy and Commerce Committee. "You are unfit to hold public office and undeserving of the public trust." Pruitt dismissed the allegations of ethical misconduct as "half-truths" and suggested that he is the target of a partisan attack. "Let's have no illusions about what is really going on here," he said. "Those who have attacked the EPA and attacked me are doing so because they want to attack and derail the president's agenda and undermine this administration's priorities. I'm simply not going to let that happen." Pruitt has been at the forefront of the administration's deregulation push. He has challenged the scientific consensus behind climate change and worked to roll back Obama-era policies designed to limit carbon pollution. Rep. Joe Barton, R-Texas, cheered those moves and suggested Pruitt is being targeted for retaliation. "If you can't debate the policies in Washington, you attack the personality. And that's what's happening to you," Barton said. Rep. David McKinley, R-W.Va., agreed, calling the allegations against Pruitt a "classic display of innuendo and McCarthyism." Some Republicans from swing districts were more critical of the EPA administrator. Rep. Ryan Costello, R-Pa., who represents suburban Philadelphia, questioned whether Pruitt's costly, 24-hour security detail is necessary. "I'm just going to be very honest with you," Costello said. "When folks read about trips to Disneyland, professional basketball games, Rose Bowl and the additional security detail related to that, that doesn't fit well with a lot of people." Rep. Leonard Lance, R-N.J., also questioned why Pruitt needed an expensive, soundproof phone booth in his office when similar facilities are available elsewhere in the EPA building. "I think it was a waste of funds," Lance said. Pruitt was also challenged over a new proposal to limit the scientific studies the EPA can use in making regulatory decisions. Pruitt defended the proposal, which would allow only studies that make all data publicly available, as a step toward greater transparency. But it has been challenged by organizations like the American Association for the Advancement of Science. Rep. Raul Ruiz, D-Calif., said the proposed rule would exclude the kind of epidemiological studies that have been the basis for landmark regulations in the past, because those studies often include nonpublic, personal health information. "You have done this to allow your rich and powerful corporate friends to create more pollution in order to increase profit at the expense of the public good," said Ruiz, an emergency room physician. Pruitt's fate at EPA may depend on his performance in back-to-back hearings Thursday and whether they satisfy the growing number of people with questions about his actions in office. President Trump has stood by Pruitt for weeks, tweeting that he is "doing a great job." But he has fired other Cabinet-level members shortly after praising them. "These hearings are clearly make-and-break hearings for Scott Pruitt," says Ana Unruh Cohen of the Natural Resources Defense Council. Pruitt will be hoping to satisfy the many questions from lawmakers — but his main audience will be down the street, at the White House. It promises to be a long day for Scott Pruitt, the chief of the Environmental Protection Agency. He's going to be testifying before two House subcommittees today as questions pile up about ethics and spending decisions that he has made. NPR's Peter Overby reports. 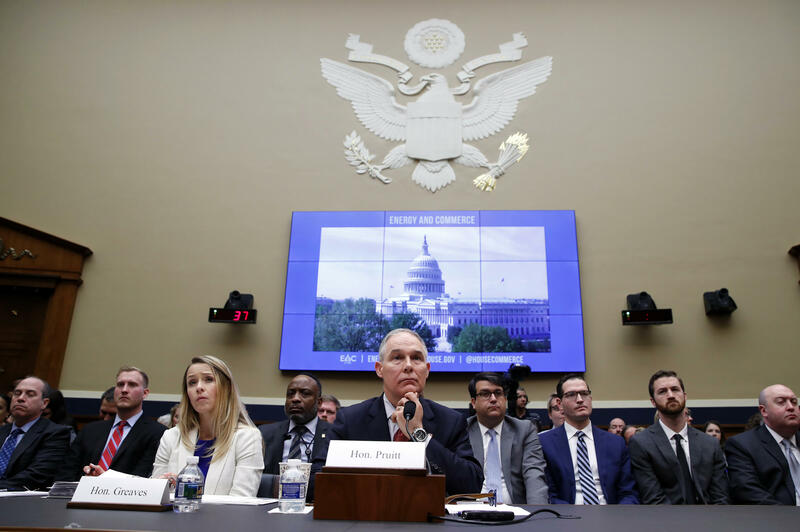 PETER OVERBY, BYLINE: Officially, both hearings are about EPA's budget for 2019, and Pruitt's prepared remarks don't mention the ethics issues. Still, they're sure to come up. It's a long list. For starters, first-class air tickets for his travel, a soundproof phonebooth for his office and a sweet deal - 50 bucks a night - for a condo on Capitol Hill. NPR counts 11 inquiries by agencies and congressional committees, some with multiple topics. Here's Pruitt defending the condo deal recently on Fox News. SCOTT PRUITT: When you look at the issue and the facts - which most people don't - but when you look at the facts of what I leased and what I paid for, it is absolutely 100 percent ethical. And it was signed off and is legal. OVERBY: There's more to it than that. It turns out the landlady's husband is an energy lobbyist who met with Pruitt. Try as he might, Pruitt hasn't been able to make these issues go away. Jerry Taylor is president of the Niskanen Center, a libertarian think tank. JERRY TAYLOR: New information continues to come out about behavior at the EPA, and all of it is incredibly disturbing and utterly unprecedented. OVERBY: Republicans are getting tired of it. Wyoming Senator John Barrasso, chairman of the Senate's primary committee on environmental issues, had praise for Pruitt in January. JOHN BARRASSO: Scott Pruitt's policies at the helm of EPA likely have protected more jobs and promoted more job growth than any other EPA administrator in history. OVERBY: Last week, Barrasso wrote Pruitt a stern letter asking him to account for his four different email addresses at EPA. And in an interview with Fox News's Chris Wallace, House Oversight Committee Chairman Trey Gowdy laughed at Pruitt's claim that he had to fly first class to avoid belligerent people in coach. TREY GOWDY: So the notion that I've got to fly first class because I don't want people to be mean to me, you need to go into another line of work if you don't want people to be mean to you, like maybe a monk. OVERBY: Some of these problems might have been foreseen. At Pruitt's confirmation hearing back in January 2017, Democrats challenged his record as attorney general of Oklahoma. Pruitt led legal battles against further regulations on the energy industry. Democratic Senator Jeff Merkley of Oregon asked Pruitt about a letter he had sent to EPA. The Oklahoma attorney general was helping an Oklahoma energy company fight EPA policy. JEFF MERKLEY: You acknowledge that 97 percent of the words in that letter came directly from Devon Energy? SUSAN COLLINS: I think Scott Pruitt is the wrong person to head the EPA. OVERBY: An EPA spokesman said Pruitt regards today's hearings as an opportunity to reiterate the accomplishments of President Trump's EPA, but Ana Unruh Cohen of the Natural Resources Defense Council sees it more starkly. ANA UNRUH COHEN: These hearings are clearly make-and-break hearings for Scott Pruitt. OVERBY: And his main audience will be down the street at the White House. Peter Overby, NPR News, Washington. Transcript provided by NPR, Copyright NPR.